Pan Youxun 潘有勋 (1745-1780) — courtesy name “The Arriving Subject”, style names “Stone Monolith” and “Virtuous Lotus”, pseudonyms “the Impersonator”, and “Monk of the Demon Pavilion”, aliases “Zhengxie” and “Zhengde”, occasional sobriquets “Shallow Well” and “Expensive Drunk”, born in Guangzhou city 10th year of the Qianlong reign (1745), passed the examinations in 27th year of the Qianlong reign (1762), and the first noted investigator of the primitive cloth paintings of the Western Ocean Barbarians. Pan Youxun was the second son of the wealthy merchant Pan Qiguan (1714-88), known to some barbarian illiterates as Puankhequa. Lucky to have had both a dutiful younger brother and a fraternal cousin who followed in the family business, he was released from those vulgarities and privileged to devote himself to serious self-cultivation from an early age, following in the example of his learned older brother, the encyclopediaist Pan Youwei. Though a precocious enough scholar, Youxun nevertheless failed to gain any useful appointments, write any obscure treatises, or win any drunken poetry contests. Instead, Pan Youxun left behind some scattered compendia, miscellany and commonplace notebooks, and it is only from a recent and partial reconstruction of these scattered papers that the outlines of his researches can be discerned. Records of the local learned societies corroborate that Pan Youxun sustained a deeply bizarre interest in the barbarians of the Western Ocean, whom the Persians called the Farangi, a term which the common people of the Southeast Coast pronounce “Folangji”, which they also use for the canons with which the Farangi fired willy-nilly like devils. Our reconstruction of Pan’s fragmentary notes reveals that he took little notice of the causes of these barbarians’ violent character, but rather a serious scholarly interest in their primitive cloth paintings. As Pan Youxun surmised, these barbarian cloth paintings were but square or rectangular pieces of thick cloth, stretched over meager sticks of wood attached together at the corners to fashion a rudimentary rectangle. They decorated the front of that cloth with colors they had manually assembled from the raw sources of the earth, all the better to imitate the rude world that they came from. Though they prized such objects as highly skilled and artistic, these meager decorations required no cultivation nor special discernment to make, and soon most of the illiterate craftsmen of the Guangzhou docks could easily produce them. It was in visiting one of those painting shops that Pan Youxun first learned of the bizarre and delusional notion of art among these barbarians. Pan Youxun’s genius can be glimpsed retrospectively from the extremely accurate hypotheses he left in fragmentary observations of these barbarians’ culture. Most impressively, he correctly diagnosed the visual framework for personhood in that culture, a culture for whom the so-called “self” was made apparent through momentary visual depictions of a person’s face, a practice to which much wealth is apportioned to hired hands. Such fashioned images were exchanged in gifts, carried as talismans, and openly displayed in the domestic spaces of the persons depicted even when they were still alive — as if with no embarrassment for their vanity. Pan Youxun diagnosed this utter lack of cultivation as a symptom of their mistaken ascription of power to the mere appearances of reality. Indeed, Pan Youxun discovered that these barbarians had such faith in the perceived magical powers of these dull and unlively representations, that they believed such images would instill fear and astonishment among all peoples under heaven. Of course, such fetishism has been observed for centuries in the worship systems of barbarian and semi-barbarian peoples throughout the Empire, most of whom have certainly since developed exquisitely complex representational systems for their deities, but the Western Ocean Barbarians were particularly late in acquiring this cultural development, and moreover were particularly self-aggrandizing in their delusions. Anonymous Chinese Artist, The Englishmen, album leaf from a two-volume album, gouache watercolor on paper, c.mid-18th century. Source: Howard and Ayers, China for the West, 1978. As Pan Youxun noted from the minor histories of his own province, in the early Ming, the Western Ocean Barbarians had even sent a religious idiot all the way from Italy to Guangdong’s provincial capital, Zhaoqing. That man, along with his associates, dressed as a Buddhist monk and put ridiculous Daoist claims on his door, and with great fanfare showed off a big drawing of a simple map to the local peasants, apparently expecting that from this they would eventually come to worship his fake Buddha. (How, in the dreamings of that idiot, a gigantic image of the boundary lines between tributary states could possibly be related to the will of Heaven or the ephemerality of the Dao remains something of a local riddle to us today. In any case….) Through his researches, Pan Youxun even accurately predicted that, as their history progressed, the concepts of simulation, mirrors, signs, replicas, and false representations, would become subjects of great hermeneutic obsession among their philosophers — areas of arcana which preoccupied their learned men and stagnated their moral philosophy, which of course led to the well-known bloodthirst of their governments.As the son of a wealthy merchant, and an unaccomplished scholar, Pan Youxun ironically had the time and means to conduct his research in an unconventional manner, and it is indeed for his methodological innovativeness that we applaud this otherwise failed scholar. We speculate that since his honorable mother was only a chamber-wife without standing who came from a poor family, it was probably by witnessing her humble attachments to the most plebeian levels of our society that it occurred to him to apply the technical mind to classical problems. It would appear that Pan’s interest in the Folangji was first ignited after he went, along with a group of drunken friends, to visit that strange and eccentric figure known locally as Lin Qiguan (or “Loum Kiqua” to the barbarians), the southwest barbarianologist who had travelled by their ships, via the Lesser Western Ocean Country (Goa), all the way to the Greater Western Ocean Country (Portugal), arriving there in the 20th year of the Qianlong reign (1755). In that strange land, Lin Qiguan had the misfortune to live through an earthquake, which was obviously a sign of the local ruler’s illegitimacy. Lin Qiguan told them the story of how he then travelled over land and water, ending in the cold, barren country of Yingjili, where he was greeted by their king, who called himself by only one name, George. 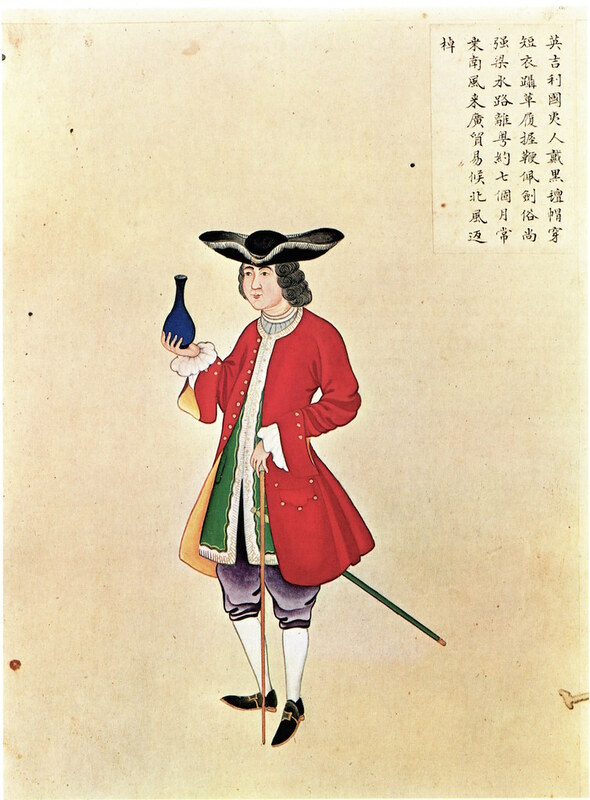 According to Lin Qiguan even the most learned men there treat the newest and cheapest ceramic wares like precious collectibles, and they drank green tea adulterated with blue powder because they lacked both tastebuds and a full human sense of color — Lin Qiguan speculated that the barbarians’ insufficiently colored eyeballs perhaps afflicts their vision. Lin Qiguan confirmed that the elite among these English barbarians were, in class and character, truly not unlike the ones sent here to trade — they, like their merchants, also wore cloaks in order to hide their daggers, and they too use black felt triangles as hats, taking them off their heads and tucking them under their arms whenever greeting equals, believing this ridiculous gesture to be ceremonious. 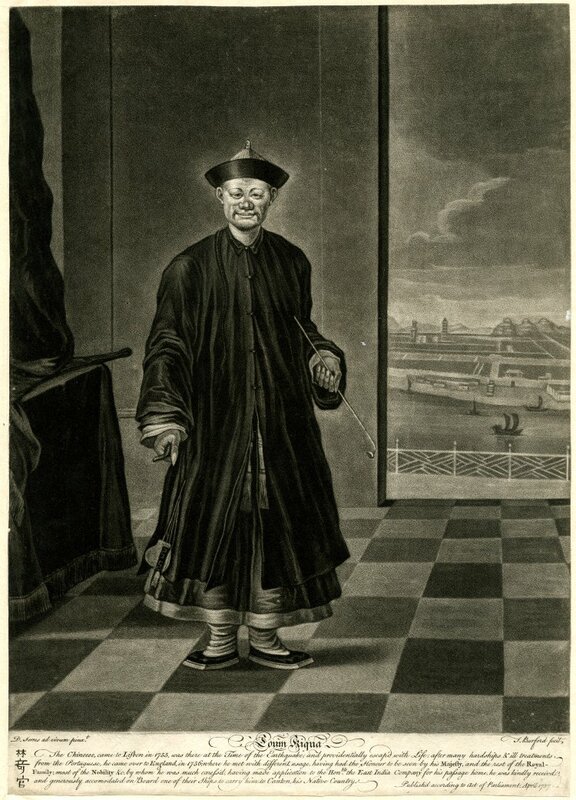 Lin Qiguan had also foolishly befriended a native named Oliver Goldsmith, and wrote many letters to him which that trickster shamelessly pirated and published under an outlandish barbarian name “Lien Chien Altangi”, which his readers mistook as a fictional pseudonym of an invented persona! From this, Pan Youxun could see that the barbarians of the Western Oceans loved to copy and pirate without the ingenuity or wit of learned men, and so correctly suspected that their so-called “arts” would also be highly derivative. Though Lin told Pan many stories of the barbarians’ strange customs, dress, and beliefs, Pan was fascinated that these vulgar people believed that their cloth paintings could be counted as “art” at all, and determined to study this delusion. Romantically sickly himself, Pan Youxun certainly could not contemplate traveling on a trade ship among commoners like Lin shockingly did. And it was evident to all that there was no hope of that Manchu Emperor allowing learned travel missions while so many tributary artists and scientists were fawning on him at his court. Neither was Pan Youxun interested in studying the Western Ocean barbarians under the noses of those tasteless and pretentious Manchus — barbarians themselves, really. So instead he took up the radical idea of cultivating, among the craftsmen of the port, a disciple whom he could train to travel and conduct first-hand observation, who might return with a record of that curious land, Yingjili. After months of frequenting the docks and patronizing the many studios that served the Folangji, Pan Youxun finally found a young and illiterate student, an artisan born into a family originating from Suzhou’s Tiger Hill. The family were makers of clay modelled faces, a regional craft which the hairbrained Prince Yinzhen once elevated to the court practice of portraiture when he had one made for himself during his father’s reign! Just like that barbarian Manchu, it would seem that the Folangji had nurtured a love of this craft as well, and this young man maintained a healthy business making such vulgar, colorful, and three-dimensional, “self”-representations at the port for them. Pan Youxun quickly made plans to send this poor young artisan to Yingjili, and gave him the travel name Kay Gua, or “Strange Quack”, a poetic pun on the Cantonese pronunciation of the travel name of Lin Qiguan. Due to Kay Gua’s poor Cantonese accent, and the illiteracy of the English Captain who took him onto his ship, this name got written down in their primitive lettering as “Chit Qua” and so that was how he came to be known among them, and why the English record keepers never recognized the obvious connection between their first and second visitors. Despite his lack of learning, Pan had chosen Chit Qua because he had a perfect visual memory and could instantly memorize the eleven exterior views of any face with just a glance. This skill was of course a necessary part of his craft, and why he was so quick and successful at making portraits of those barbarians. Pan Youxun trained Chit Qua to exert his visual memory on proper two dimensional visual works, and to return with an excellent memorized record of those primitive cloth paintings. Moreover, Chit Qua could make those silly models for all the primitives he met, thereby gaining access to the men considered the most artistic and learned among them, and seeing the barbarian cloth paintings that they tastelessly displayed all over the walls of their homes. Through his father’s connections with the traders, Pan Youxun secured passage for Chit Qua onto the ship of a Captain Alexander Jameson, who was a private agent for one of their famous merchants of utterly pretentious timepieces, James Cox. Chit Qua arrived in London in the 24th year of the Qianlong reign (1769), and so enamoured of the craft of modelling faces were these Englishmen, that Chit Qua was regarded by them as a great artist of China! Dear reader, we can imagine the uproarious laughter that filled the fragrant courtyard when that humble artisan Chit Qua returned home to tell his tales to his teacher and his teacher’s friends, which included even the teacher of the teacher of the Ju brothers. Chit Qua was greeted by their ruler, this time known by the same name as his grandfather to which they added only a new number to identify him, so unable are they to mark historical time. He was sent to the center of their pathetic artist’s association, a sort of labor union for professional artists, which they pretentiously called the “Royal Academy”. For in this country, by merely plying one’s trade, one could apparently be awarded mock-aristocratic titles and treated as men of learning — even when they were poor scholars who could only read their own languages and couldn’t write any acceptable poetry. In this respect they were as pretentious as our local merchants. One of their presidents, a certain John Mortimer, painted the face of Chit Qua on their cloth. In this image, he depicted the humble artisan wearing an official’s cap, another sign that their culture had simply not yet learned the difference between a craftsman and a bureaucrat, let alone the distinction between art and craft! Chit Qua made many models of the faces of the barbarian men he met, including one of their men of theatre, a David Garrick, one of their book collectors, a Dr. Anthony Askew, and one of their writers, a James Boswell. While he was gone, his apprentice at the Guangzhou docks also produced one of another English writer, William Hickey and his devoted friend Bob Pott. From them Pan Youxun also gained some hilarious observations. Chit Qua had even learned to write in their primitive sound system. (Incidentally, this writing system turns out to be merely based upon the sounds that they utter, which makes their writing totally illegible to the babble of dialect speakers in their countries, and which, we predict, will become a source of great metaphysical distress for their linguists.) Chit Qua learned their primitive sound notation system because it was necessary for him to write little notes empty of poetry to them prior to visits to their homes, as was their custom. Hilariously enough, those barbarians thought that if Chit Qua could write their primitive letters, he would be educated enough to read the sophisticated Chinese language! As a result, they took him to their largest library and asked him to read to them some books that one of their noble men, a Hans Sloane, had assembled from China and its tributary states. Of course, poor illiterate Chit Qua could only point to them which drawings they had pasted upside down or sideways because those barbarians simply could not read nor even decipher a simple image of flowers. Thankfully his disguise as an actually educated artist of stature was somehow not obvious to them but Chit Qua realized that he had better leave those lands before all was revealed. Most of the barbarians were certainly savage in character, and Chit Qua experienced several physical assaults, including being beset on by a gang who threw him overboard on his first attempted journey home. But luckily Chit Qua returned to his teacher without too much harm done to his health. After his return, his teacher personally accepted him into his household as a library assistant, and instructed him to reproduce in clay, and eventually paint in barbarian oils and cloth, all the barbarian cloth paintings he had memorized in the Yingjili country. From these works, Pan Youxun was able to seriously deepen his research. For two years, Chit Qua lived an idyllic life in the sumptuous Pan home, but he could not help but pine for the love of his teacher’s younger sister. One night, in a bout of heartsickness over his lowly stature, Chit Qua drank a poisonous draught and left this world. The death of Chit Qua was a great loss to Pan Youxun, but he had already groomed and sent another student intrepid enough to travel to such far and difficult reaches. This time it was the young Huang Yadong. During Chit Qua’s absence, Pan Youxun had cultivated a friendship with the wealthy tea merchant John Bradby Blake. Blake had devoted himself to learning to appreciate Chinese bird-and-flower paintings, but had terrible taste. Instead of learning to paint properly himself, he actually hired some of those artisans at the dock to do it for him! Pan Youxun gave him some pointers in this regard, and taught Blake to cultivate some proper sensibilities, for example to recognize the historical allusions necessary to the visibility of any given flower, or any painterly gesture made in reference to that illusionistic reality. In gratitude, Blake arranged for Pan Youxun’s new student, the refined and well educated Huang Yadong, and the son of one of Pan’s father’s merchant friends, to travel to England under the protection of Blake’s own father. Through his study of Chit Qua’s memory paintings, Pan Youxun had already correctly established that the tastes of the Western Ocean Barbarians were roughly at the level of a youth in their teens — obsessed with material reality, they invariably desired to make pictures that looked as the world of myriad things appeared to the human eye. More so than any other primitive culture, however, they were unwavering and rigid in that uncultivated eye, and hence prepared all their images with the use of straight lines and square grids, depicting the distances of things near and far by measuring them with the inflexible maths of trigonometry. They neurotically copied whatever they physically saw in every obsessive detail, and even darkened their images with the fixed blackness of shadows, as if light and dark were not forever changing. A young and undeveloped culture, they had for hundreds and hundreds of years failed to progress to the cultural level of investigating or exploring the complexities of endless change, infinite meaning, and the irreducible self. 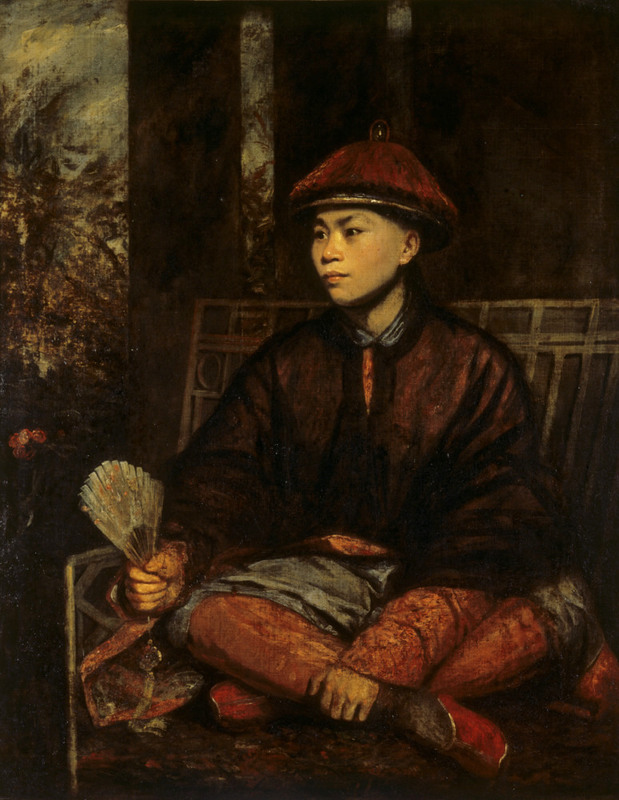 Hence Pan Youxun figured that a child like Huang Yadong could better relate to those barbarians, and could more likely diagnose their unchanging fetishism of what they called “realism”. Huang Yadong arrived in England in the 35th year of the Qianlong reign (1770). Of course, having acquired some scholarly learning, John Bradby Blake acquired an appropriately tragic scholarly sickness, and fell ill and died while Huang Yadong was en route. But Blake’s father was an honorable man, and arranged for Huang Yadong to begin his researches in one of the most noble homes of their society, Knole House, the cold stone home of one of their Dukes. 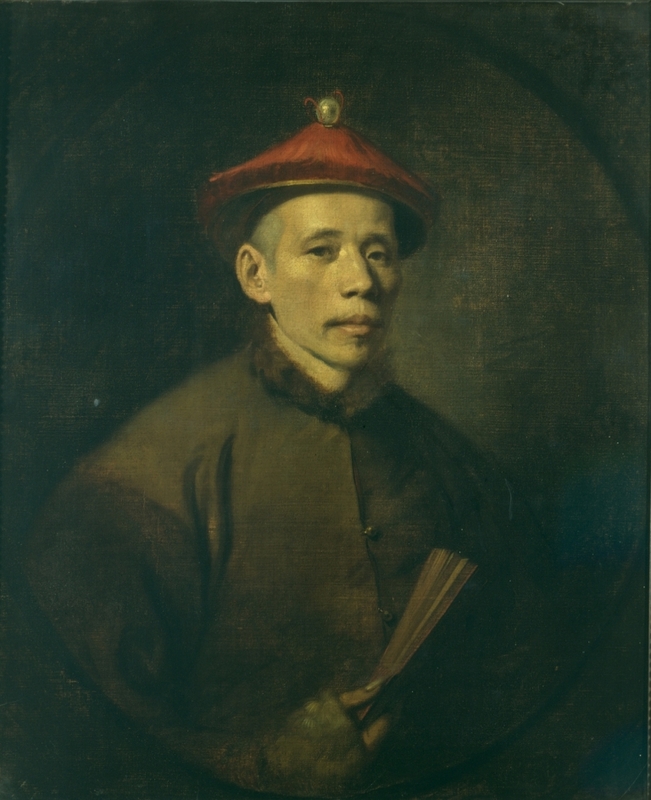 There Huang made a good study of their children, through daily observations at Sevenoaks School, one of their country’s oldest schools although it was only founded in the early Ming (1432). His meticulously recorded observations, highly insightful because the barbarians likely treated him as a “participant observer” — since we can assume they were familiar with the basic procedures of anthropology — enabled his teacher in his last works to speculate just how and why these barbarians remained so childish in their aesthetics. Not surprisingly, Huang Yadong discovered that the barbarian children’s calligraphy was awful — lacking in any archaisms whatsoever, and that by the age of nine they still could not write any poetry nor play any mournful music with the affects of a critical nostalgia. But that still did not account for the uncultivated sensibilities of their most learned and most elderly men. Through his researches in the art collections of his host’s home, Huang conjectured that this was because this society had divided their philosophers from their painters, their poets from their mathematicians, their rulers from their scholars. The seven years that Huang Yadong spent at Knole was useful indeed, for he not only lived in one of their most well-appointed homes, but was a constant companion to the Duke’s favored concubine. He even taught one of their more learned men, a William Jones, a few characters so that those barbarians could at least begin to read. Huang Yadong returned home to his teacher with rich materials and observations, but was eventually forced to devote himself to his father’s merchant business. Alas, such is the materialism of our age. 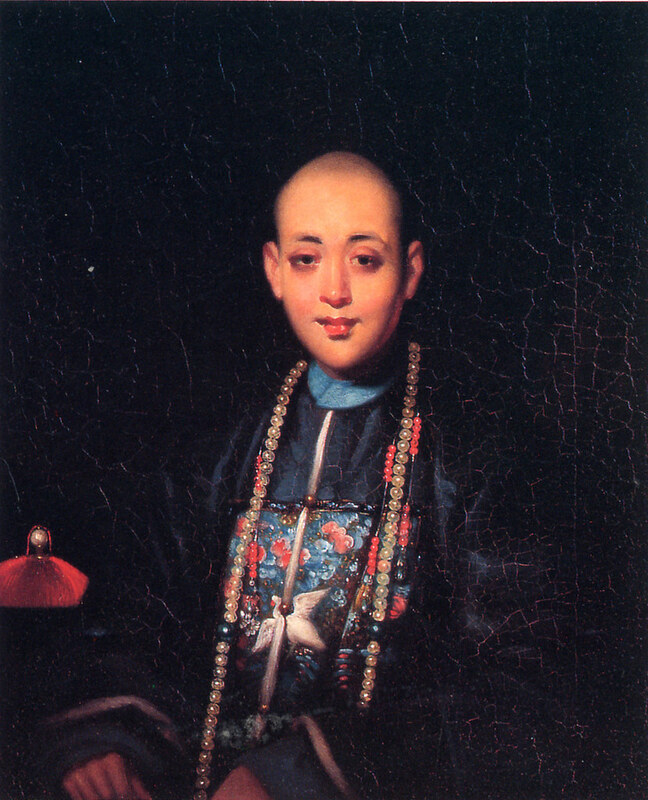 For his part, Pan Youxun, died in this, the 45th year of the Qianlong reign (1780), having accomplished nothing and attained little acclaim, so we, the provincial biographical administration, grant him no honorary titles and only the posthumous names, Lover of the Strange, Sympathizer of the Rude, and Barbarianologist of the Farthest Peripheries. Winnie Wong is a historian of modern and contemporary art and visual culture, with a special interest in fakes, forgeries, frauds, copies, counterfeits, and other non-art challenges to authorship and originality. Her research is based in the southern Chinese cities of Hong Kong, Guangzhou and Shenzhen, and her writing engages with Chinese and Western aesthetics, anthropology, intellectual property law, and popular culture. She is the author of Van Gogh on Demand: China and the Readymade (University of Chicago Press, 2014), which was awarded the Joseph Levenson Book Prize in 2015. This essay is the fifth offering from our new Conjectures series, a venue meant to serve as a laboratory for experiments with historical form and method. The reader is asked to keep a live eye on these texts, which thread between past and present, between the imagination and the archive, between dreams and data. The Series Editor is D. Graham Burnett.